When I was planning my wedding last year, I felt like I was counting down the minutes until one item crept onto my to-do list: commissioning my wedding cake! In the middle of all the decisions that I had to make, one of them just involved me snacking on tasty treats, and I couldn’t wait for that first bakery meeting. 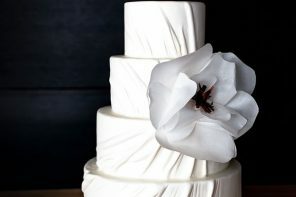 But when, mid-bite through the chocolate ganache filled creation that would eventually become the interior of my wedding cake, the baker asked me what I had in mind for the exterior design, I froze. I hadn’t even thought about it, and I had no clue what to say. 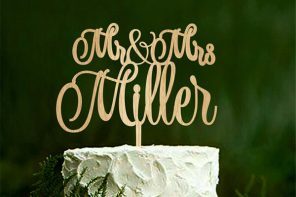 More power to the Pinterest brides who have cake idea boards galore, but many of us have no clue where to even begin when discussing cake design. 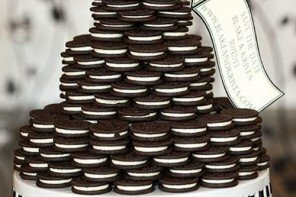 If you, like me, are unsure what’s in and what’s out in wedding cakes this year, never fear! We chatted with shop owners and cake decorators at five top-rated bakeries across America and asked them to share their favorite trend of the year. One or two of them may surprise you! 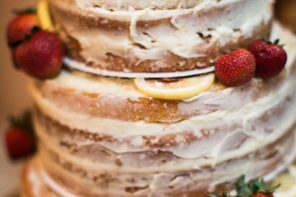 With the rise of rustic chic weddings and twinkle lighted receptions in converted barns, the popularity of naked, or half dressed, cakes has increased, too. Amy Kossman, of Piece of Cake Desserts, says that these partially dressed cakes have been, hands down, the most popular design at the bakery this year. 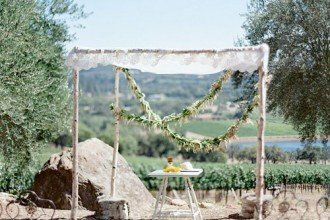 Occasionally brides will ask for a little more ornamentation, such as a colored drip, to tie into the wedding colors, but the rustic feel of this style is what draws the attention of many brides. 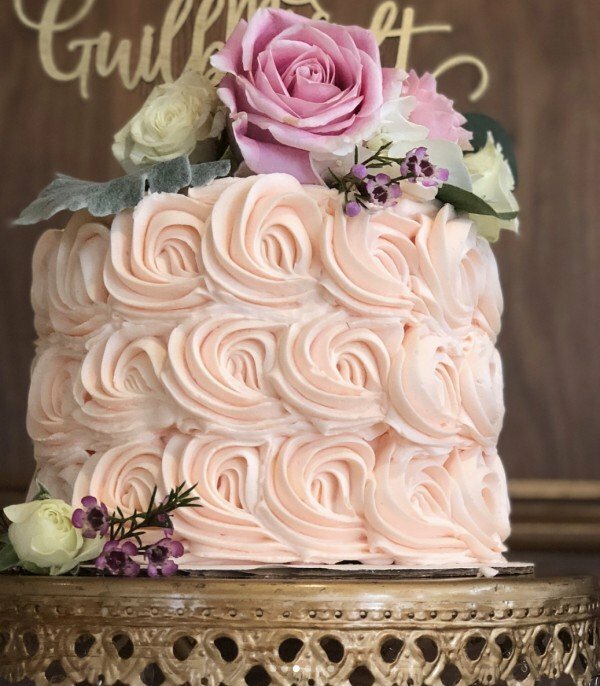 Nothing is more timeless than a wedding rose, and Erin Zemelo, owner of Sugar Mama’s Sweets and Treats, says that she has seen many more brides this year looking to work the flower into their cakes. 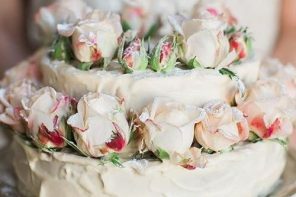 Using buttercream frosting, the cake decorator sculpts the outside of the cake to look like a bed of just-bloomed roses. Zemelo believes this look is fashionable right now because it gives the more intricate look of fondant while losing the stiff, less-than-tasty qualities. The beautiful blooms add intricacy to the wedding cake without overdoing it, making it an eye-catching addition to a wedding reception. 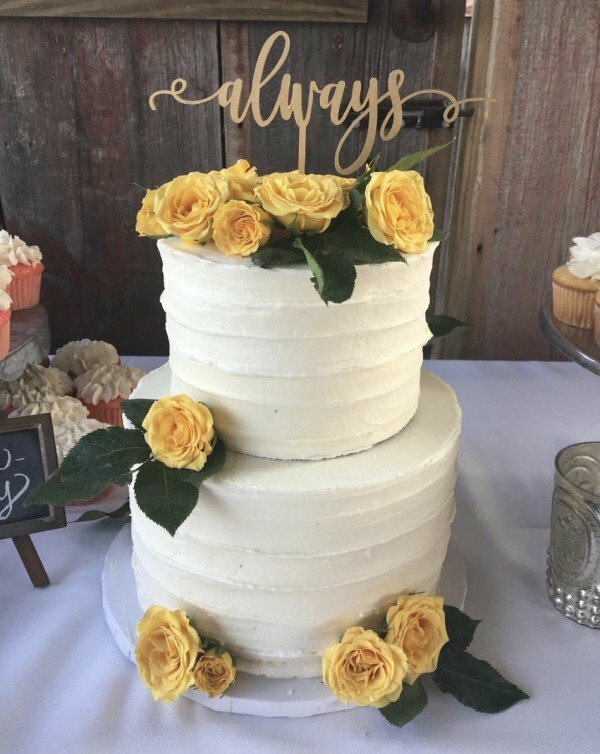 Especially for brides planning destination weddings, reflecting the environment of the wedding venue is definitely in, says Jennifer Winchester, a cake decorator at A Special Touch – Cakes By Carolynn. 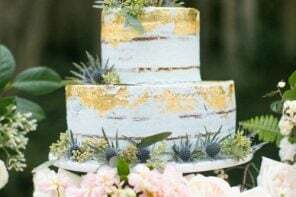 Because her shop is located in Jacksonville, FL, a popular location for shoreside destination weddings, she says a great number of brides are asking to incorporate elements of the landscape into their cakes. 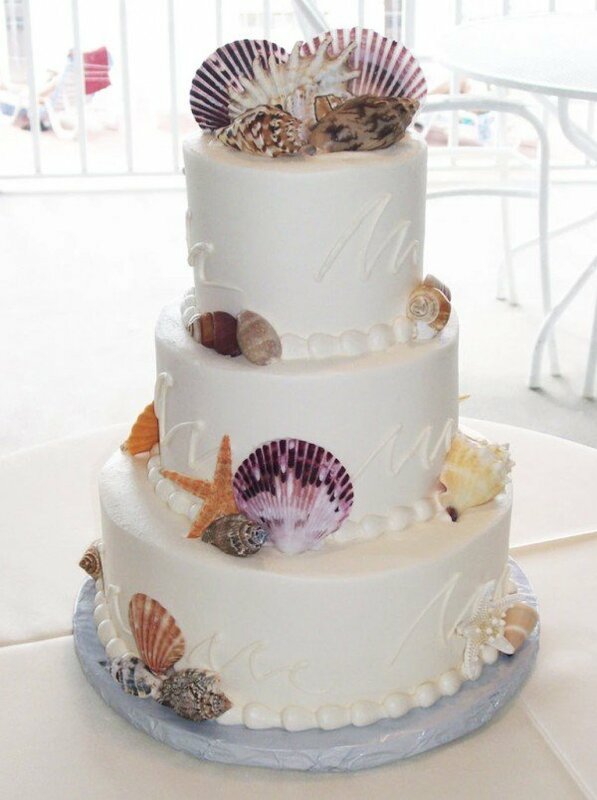 From chocolate shells to sugar sand, coral designs to tropical flowers, there are a number of ways to incorporate a theme into your wedding cake without abandoning elegance. Remember, when it comes to theming, you can always add as much or as little as you want. 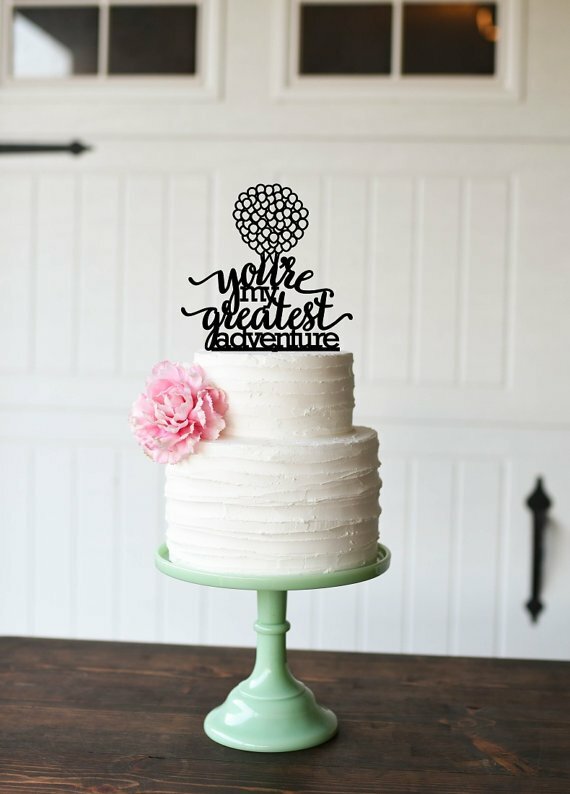 Themed cakes are also an excellent way to infuse a little more personality into your wedding cake, and, without fail, they become one of the highlights of the reception for guests! If your vision for your wedding day is more along the lines of subtle elegance, then Ashley Westhoff, owner of Sugar Beats Bake Shop, has the trend for you. 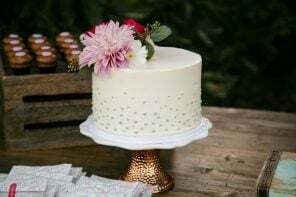 She says that the most common style she’s seen in her shop this year has been the use of gentle texture, created by softly dragging a spatula around the edge of the cake. Then, flowers are skillfully placed to give a pop of color to the wedding-white creation. In years past, intricate scrollwork and minute detailing was the name of the game, but recently, brides have been moved more by simplicity. 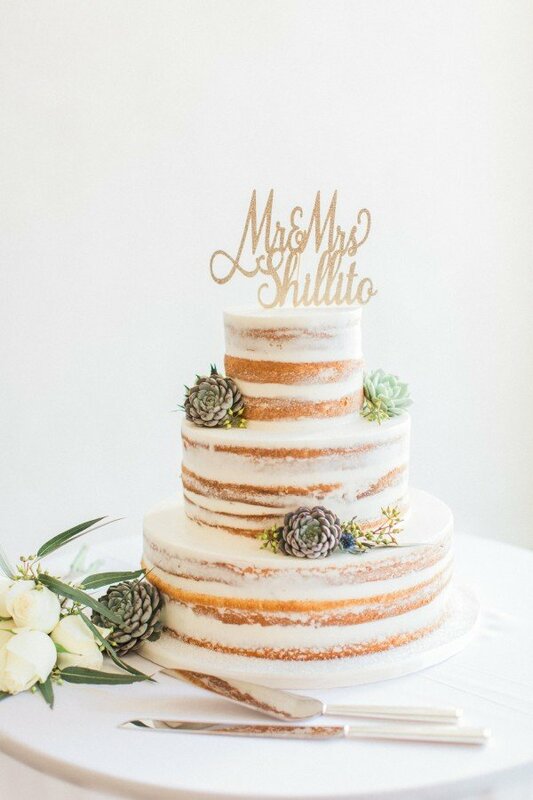 Westhoff believes that brides are so drawn to this style because it gives them a way to have a traditional wedding cake without being too fussy. The final trend that’s been popping up more and more this year is the addition of a metallic sheen. 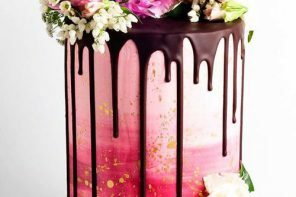 Lei Cristine Garcia, owner of WOW Factor Cakes & Desserts, has seen a rise in the number of brides requesting a touch of rose gold here and a dab of gold leaf there on their wedding cakes. 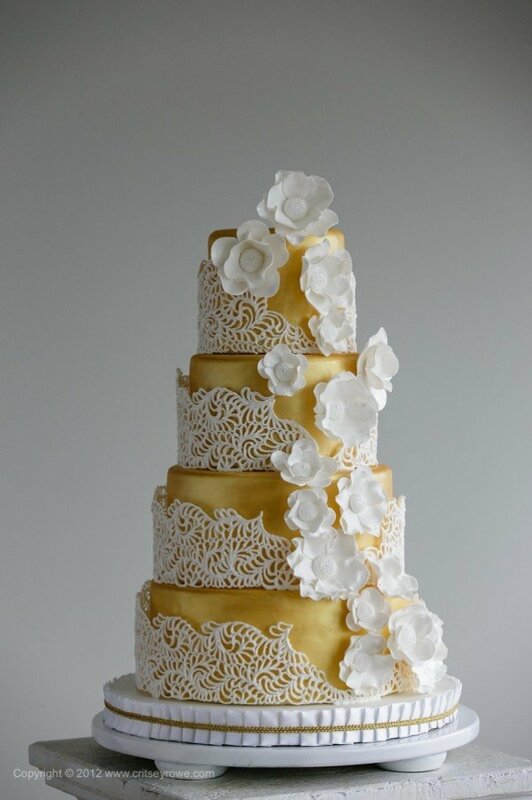 She has even been asked by many brides to coat whole tiers of the cake with a metallic glimmer. She believes that the combination of glamor and fun is what excites brides about this trend, and the promise of a metallic cake aglow under romantic twinkle lights is undoubtedly hard to resist. After learning about each of these wedding cake trends, the difficulty lies in choosing just one! But, by considering these trends from bakeries across the country and following the advice of your baker, I have no doubt you are going to create the wedding cake of your dreams!